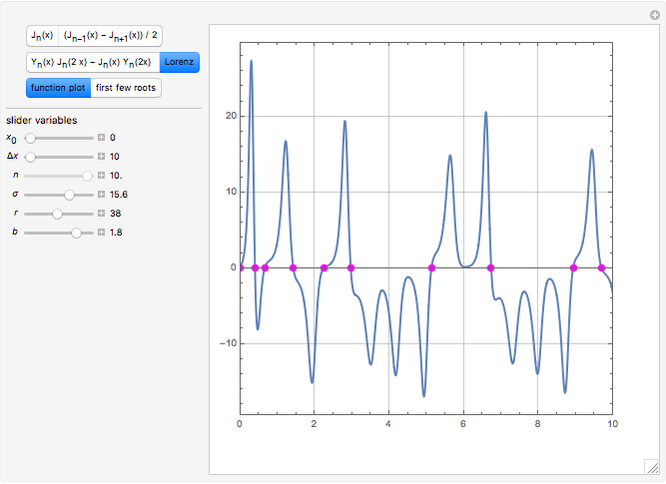 Mathematica's built-in function FindRoot is the preferred method for finding a zero of a nonlinear function . However, determining all the zeros of in a specified interval using FindRoot can be challenging, as this requires having good initial guesses for all the roots. In some cases, the initial guesses can be found by examining the asymptotic structure of as , but this is not always possible. This Demonstration shows how the computation of the zeros for a nonlinear equation can readily be accomplished by augmenting the calculation with a graphical technique to obtain the initial guesses in a specified interval . The functions considered in this Demonstration are (the Bessel function of the first kind) or a linear combinations of Bessel functions such as or . Another possible problem involves , in a numerical solution of the Lorenz equation. The general idea of calculating approximate roots of a function using graphical techniques is discussed in . 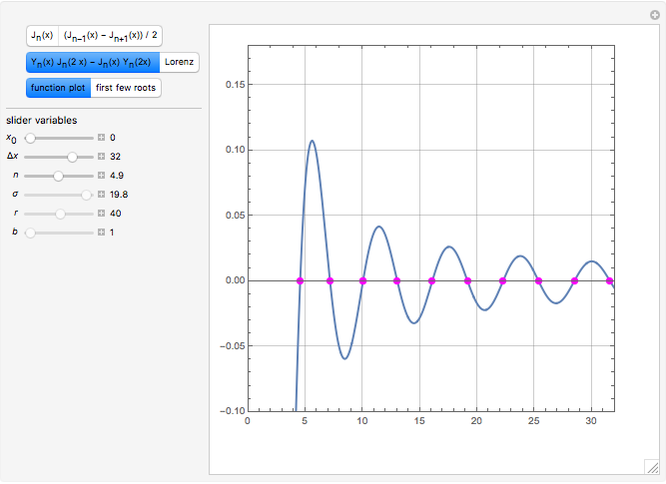 You can specify the order of the Bessel functions using a slider. For the Lorenz function, you can specify the parameters in the Lorenz equations. For certain values of the Lorenz parameters, the solution is chaotic, and thus the zeros of are not predictable. The interval for the roots can be specified using the sliders for and , where . Clicking the "function plot" button shows a plot of the selected function with the calculated roots superimposed on the plot as magenta dots. 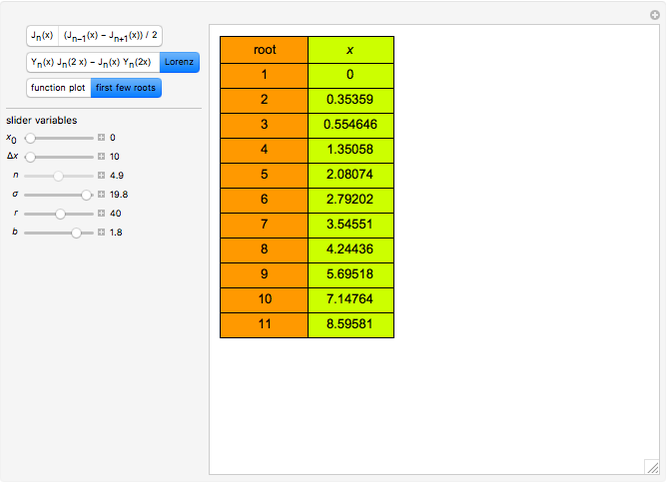 You can view the numerical values of the zeros by clicking the "first few roots" button. The zeros of the function satisfy . S. Wagon, Mathematica® in Action: Problem Solving through Visualization and Computation, 3rd ed., Berlin: Springer-Verlag, 2010. Housam Binous and Brian G. Higgins "A Graphically Enhanced Method for Computing Real Roots of Nonlinear Functions "